As a food writer, recipe blogger, and mother of a near-toddler, you’d think I’d have a clue about what to feed a baby, right? Well, I’m working on it. 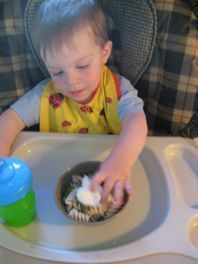 Typically, I was just getting the hang of purees when, at Leo’s 9 month appointment, the pediatrician told me to start introducing table foods. That is, whatever we eat (minus shellfish, red berries, honey and nuts). Sounds easy: Toss the kid a scrap from your plate and everyone’s happy. But as a friend points out, this implies that we parents of babies are cooking and eating real food—not cold cereal and take-out. It’s a good wake-up call. As our kids graduate to table food, we’re going to have to start eating more of the pure, whole, fresh foods that we want to feed our babies. And this takes some creativity, because we can’t cook and eat like we did pre-Leo. How do you chop an onion with a baby on your hip (or climbing ever higher on some dangerous piece of furniture if you set him down and turn around)? As I work on meal-planning for all three of us, I’ve gained immense appreciation for the wholesome, dependable meals my mom always made (if not for the smug look I can see on her face as she reads this). I used to consider broiled chicken, steamed white rice and broccoli beneath my culinary consideration; delicious, but I wouldn’t bother to cook such a “simple” meal. Now, I just wish I could figure out how to get all three of those things ready at once without quitting my (part-time!) day job. Luckily, there’s pasta. Other main courses that have worked out for all three of us are minestrone, tofu scramble, Indian dal, potato-cheese pierogi w applesauce, and cheesy grits with spinach. But in almost every case, Leo will relish a food one day, then spit it out in disgust the next. This has me constantly trying to think up new recipes for him, and scrounging in the fridge while he shrieks in his high chair at dinnertime. Could it be that only novelty is appetizing? I’ve asked myself. Would he would be happier getting a jar of baby food? And if so, how can I avoid taking it personally that my son doesn’t like my cooking? I remind myself that I can’t pin my feelings of self-worth on the whimsical palate of a 6-toothed pre-toddler with a temper. And I’ve realized that the key to my baby-feeding quandaries comes back to my all-time parenting bugaboo: sleep! should have known! When Leo naps poorly, like he’s doing now as a big tooth works its way through his reddened gums, well then, I better feed him fast and early or food will hit the ceiling. So I try to have ideas for quick, plain meals up my sleeve and to serve them often enough that they become familiar stand-bys. At its most basic, motherhood sounds simple: it’s my job to make sure the baby isn’t too hungry or tired to thrive. But wow, I just spent a year trying my hardest and at every stage I’ve struggled to meet those goals. What a job!